Bold text means that these files and/or this information is provided. 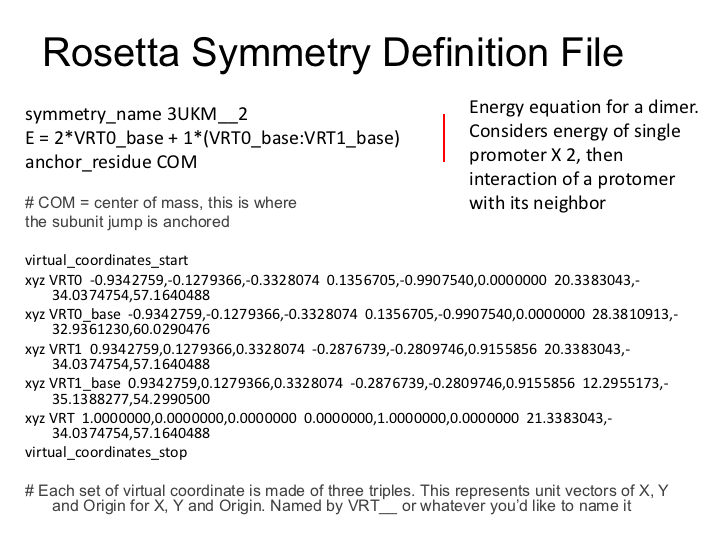 Objective: In this exercise, we will examine the Rosetta design features by mutating user-specified residues. To make it even more interesting, we will use a membrane protein which is a homodimer, so we will employ RosettaMembrane and RosettaSymmetry to model the dimer during design. RosettaScripts will be used to combine the two applications. Preparation: Locate the necessary input PDB file. You should notice that this file shows two homo-dimers. 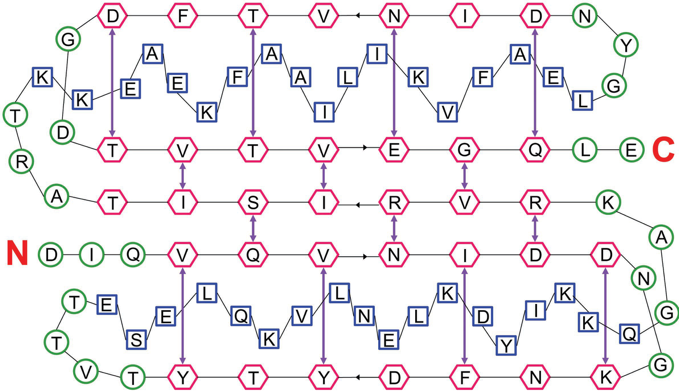 We will focus on the dimer made from Chains A and B (lower dimer when loaded). This will be important when setting up the symmetry definition file in the next step. Close pymol and proceed to step 1. Rosetta Symmetry. In this step, we will create the proper symmetry definition file for this particular protein structure. We will need the input structure from the preparation step. Here we are using symmetry to model an already-symmetric starting protein. This is called non-crystallographic (NCS) mode. We pass the mode (-m NCS), the chain we want to keep (-a A), the chain we want to base the symmetry off of (-i B), and the input PDB (-p 3UKM.pdb). WThe output will be redirected, using the greater than sign, into a new file called 3UKM.symm. Next, we will use clean_pdb.py to prepare the input protomer for setting up symmetry, grabbing only chain A.
clean_pdb.py strips PDB code that Rosetta can not parse such as comments, anisotropic atom positions, unnatural amino acid types, and waters and renumbers from 1 to match Rosetta numbering. The first argument in the script is the 4-letter PDB code and the second argument is a string containing the chains to return, in this case, only chain A. Next, run this protocol using RosettaScripts. We will apply the setup for the protocol to the input structure, 3UKM_A.pdb. The total energy score of the protein is the first number. For this protein, you will probably see a number in the positive 5000s. We know that this is not a good score for a protein. Before moving on to an application such as design, it is recommended to energetically minimize the structure in some way to get rid of imperfections in the crystal structure. Additionally, this score is based on the default Rosetta scoring function. We will need to create a span file and add the membrane high resolution scoring function into our XML script. In a web browser, go to octopus.cbr.su.se and paste the fasta sequence into the form. Then click "Submit OCTOPUS" (There is also an option to use SPOCTOPUS which considers signal peptide sequences). When it's done running, near the top it will say "A text version of the topology prediciton can be found in the OCTOPUS topology file (txt)" click on that link. Select all of the text and copy. open 3UKM.topo [delete any current content] and paste the text into this file and save. 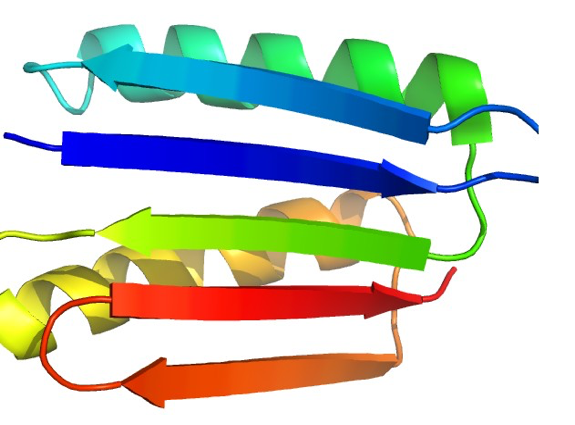 With an energy minimized input structure (relaxed version of the 3UKM_A pdb), we are almost ready to design our protein! In this step, we will first combine SetupForSymmetry and SymPackRotamers movers in another RosettaScripts protocol. You should see several input files ready for you to use. 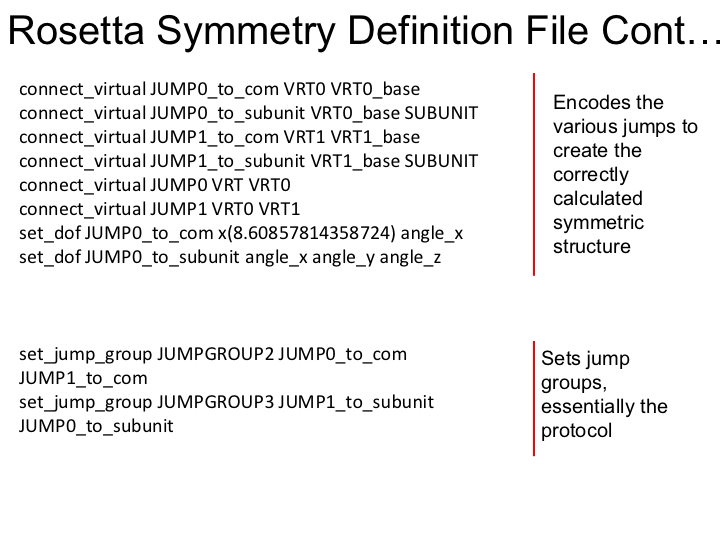 Here you will find the symmetry definition file, an energy minimized input structure named Best_rlx_3UKM_A.pdb, and an XML file. Notice under SCOREFXN, the membrane high-resolution weights are specified. Read the XML and see if you understand the different sections. Reference the lecture slides if you need to. Exit out of the file when you are done. Then run full design. This step should take about 30 minutes. In the interest of time, we will only do one full design of the protein. In the output folder, 20 output structures are provided. Design is done on a fixed backbone. Today we will use a hypothetical situation where a number of residues will be simply re-packed (minimized side-chains) by the command NATAA. A small number of residues will have a specific group of amino acids to chose from during design, and two residues will consider all amino acid rotamers during design. Based on sequence alignments from homologous proteins, we know that these positions prefer a certain type of amino acid. We are going to use a resfile to guide Rosetta during design. Look at your lecture slides and understand which amino acid rotamers will be allowed at each position. When you are comfortable with the format, exit the file. If you have questions about what you would expect-ASK! Again, many, many more structures than just 2 should be made for production runs. In the interest of time, we will just run 2 for today. This should take about 2 minutes. This step will simply ensure that you can successfully run Rosetta Symmetry and Design. Use the output structures provided in the Step3_design/output folder for the analysis step. Note that this folder contains only 20 models. In your own experiments, you will likely want to make more than just 20 models. Analysis of Designs. Now that we have a few design structures, we want to examine one of the regions we designed. First, we must sort the top five structures by score. There are many ways to do this. Here we will use command-line programs such as grep and awk. You should still be in the Step3_design folder. This shows you the top 10 structures by best score. We can use awk to store the list of the top 10. Next, we will use awk to automate generating fastas for each of our top models. In order to run this command, the PDB tools must be installed. Go to $ROSETTA_TOOLS/protein_tools and follow the instructions to install the python module. Now we can cat all of the fastas and use WebLogo to generate a figure to show our designed residues. Under advanced logo options, choose Logo Range to be 80-100. Now Click Create Logo at the Bottom. If you need to, you can re-open the resfile you used in the design step to see if Rosetta Design did what you expected. For example: Residue 94 should be T, I, or V, and residue 86 could be any apolar residue. Since we have restricted design a lot, we expect to see single identities for these positions in this sequence logo. If you have enough time, you can go back and make a sequence logo over this same range for the full design output. Compare the logos. You should see quite a bit more variation in the full design sequence logo. 1b. Analyze the output. There are a few ways of going about this. Some may look at just the best scoring models. 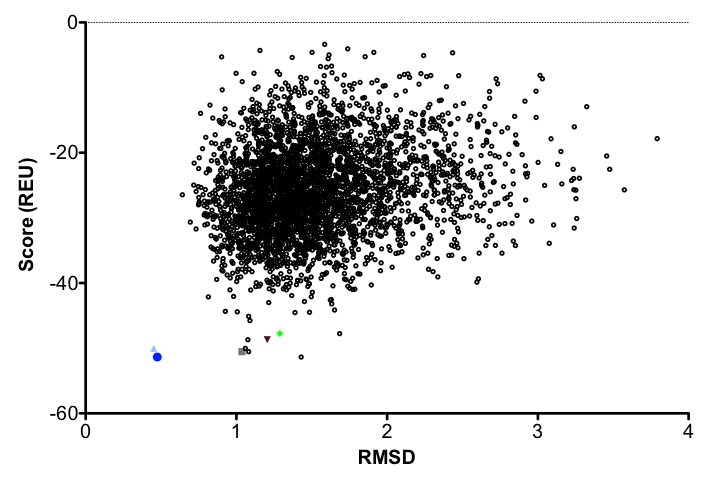 Others calculate the RMSD of the relaxed models to the input structure and plot the Score vs. RMSD to find the best (lowest) scoring model that is most similar to the input structure. Last, a note for Protein Design Analysis. A script named Deep_Analysis, written by Jordan Willis is available as an alternative to the WebLogo server. It is in $ROSETTA_TOOS/protein_tools/scripts/deep_analysis. There are many options such as using fastas or pdbs as your input. You can also pass a resfile to specify which regions you want to appear on the logo (instead of a single range). 2a. Rosetta Design using the Rosetta Membrane Framework. The steps to setup Rosetta to use the Membrane Framework are slightly different than Membrane Mode. To properly use span information throughout the protocol, one must use the movers and before setting up . For simplicity, we will treat the protein as monomeric, which will make this protocol run a bit longer than the previous one. Expect about 20 minutes per output decoy. In the future, symmetry and the membrane framework will be more compatible. 2b. The ./output/ directory will have 25 design structures. You can do a similar analysis as we did above on these to look at the sequence variability.